ForeFlight’s Military Flight Bag (MFB) is a service available to US military and government pilots who have approval to access the Department of Defense Flight Information Publications, or FLIP. 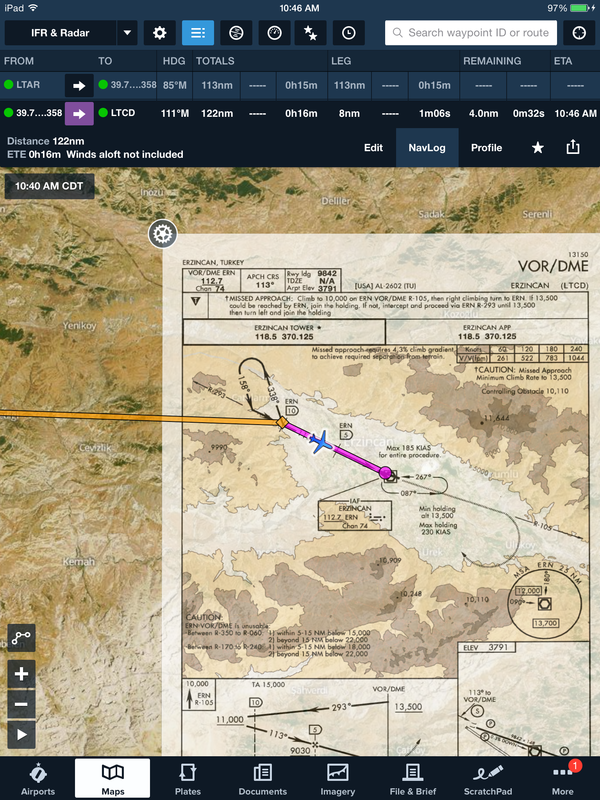 MFB supports the global flight operations of these pilots by providing a worldwide geo-referenced library of Department of Defense approach plates, airport diagrams, and chart coverage, all fully integrated with the ForeFlight Mobile Pro app. Plate on Maps view is shown in the moving map mode with a geo-referenced FLIP approach chart. For even greater situational awareness, pilots can overlay the geo-referenced procedures and diagrams onto IFR enroute charts, VFR sectionals, and other base maps for a seamless moving map view of own ship position along with hazard and weather information. Organize Flight Information Publication documents and more into binders. Stay current with Document Syncing. 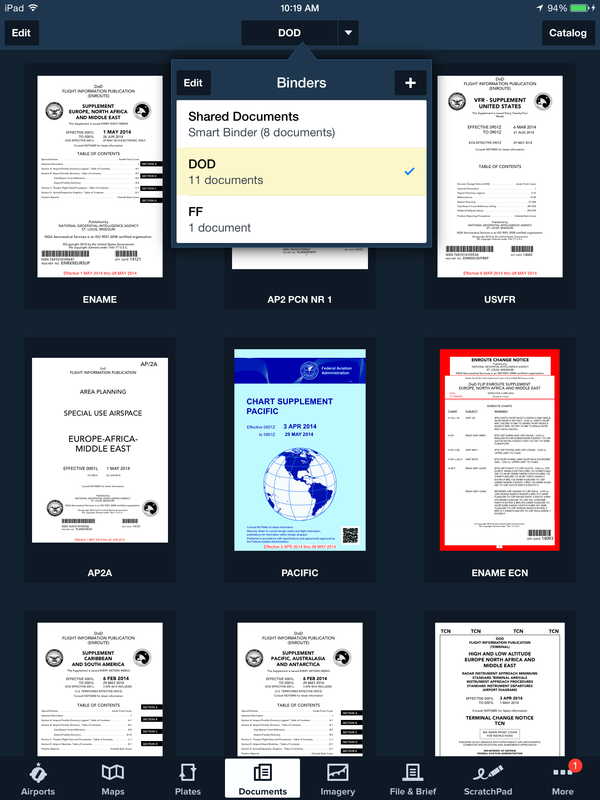 ForeFlight’s Document manager organizes Flight Information Publications like Airfield Qualification Program (AQP) pages, Planning Change Notices, Area Planning Documents, Chart Supplements, Enroute Change Notices, and Terminal Change Notices. Customers can also import their own documents and, with Document Syncing, keep all crew members up to date with current procedures and operating manuals. To ensure compliance, administrators can add and remove documents and monitor database currency on each device via a web-based tool. Keeping MFB data current is easy via the in-app Download manager. This capability eliminates the need for the DVD, and all charts, documents and data are encrypted and delivered via Wi-Fi Internet. View Airfield Qualification Program (AQP) pages, Planning Change Notices, Chart Supplements, and more. Trace your taxi route using annotations and view own ship position on geo-referenced airport diagrams. The DOD download options are shown in the Download Manager view. By tapping in to the DOD option, you can select the geo-regions you wish to download for use. Military Flight Bag can be purchased by qualified individual pilots on the ForeFlight website for $274.99 per year. Customers with an existing ForeFlight Mobile Standard or Pro service, will see a pro-rated credit at checkout for Military Flight Bag. To get started, visit www.foreflight.com/military. Organizations that are interested in multi-pilot accounts should contact sales@foreflight.com for pricing information. Multi-pilot accounts are great for crews who wish to manage ForeFlight access for two or more pilots in a single administrative interface. This entry was posted in ForeFlight Mobile, Military Flight Bag and tagged aviation, electronic flight bag, foreflight, ForeFlight Mobile, iPad, military flight bag by ForeFlight. Bookmark the permalink.